The U.S. military is ready to carry out more strikes, CBS News national security correspondent David Martin reports. But whether it does will depend on getting good intelligence on the whereabouts of any al Qaeda operatives left alive. A Somali Defense Ministry official described the helicopters as American, but witnesses told The Associated Press they could not make out identification markings on the craft. Washington officials had no comment on the helicopter strike. The U.S. is hunting down Islamic extremists, said the Somali defense official, who spoke on condition of anonymity because he was not authorized to talk to reporters. "These guys deserve to be dead," said CBS News consultant Michael Schueur, a former CIA officer. "I hope we did get them, but in the strategic sense of 'are we closer to winning this war?' I think that's probably not the case." On Monday, a U.S. Air Force AC-130 gunship conducted an initial strike – part of a wider air offensive against suspected members of al Qaeda - Martin first reported. The Pentagon confirmed Monday's strike targeting al Qaeda operatives late on Tuesday, but did not give any information on who was actually killed. The targets included the senior al Qaeda leader in East Africa and an al Qaeda operative wanted for his involvement in the 1998 bombings of two American embassies in Africa, Martin reported. Those terror attacks killed more than 200 people. Earlier, Somalia's president said that the U.S. was pursuing suspects in the 1998 bombings of two U.S. embassies in East Africa, and that the effort has his support. Somali troops and their Ethiopian allies were attacked in the capital late Tuesday by gunmen riding in two pickup trucks who fired two rocket propelled grenades, witnesses said. The rocket attack was followed by several minutes of rifle fire. One Somali soldier was killed and two other soldiers and a bystander were wounded, said minibus driver Harun Ahmed, who took the injured to a hospital. Col. Shino Moalin Nur, a Somali military commander, told the AP by telephone late Tuesday that at least one U.S. AC-130 gunship attacked a suspected al Qaeda training camp Sunday on a remote island at the southern tip of Somalia next to Kenya. Somali officials said they had reports of many deaths. On Monday, witnesses and Nur said, more U.S. air strikes were launched against Islamic extremists in Hayi, 30 miles from Afmadow. Nur said attacks continued Tuesday. "Nobody can exactly explain what is going on inside these forested areas," the Somali commander said. "However, we are receiving reports that most of the Islamist fighters have died and the rest would be captured soon." In Washington on Tuesday, Defense Department spokesman Bryan Whitman spoke of one strike in southern Somalia, but would not confirm any of the details or say whether any al Qaeda militants were killed. The assault was based on intelligence "that led us to believe we had principal al Qaeda leaders in an area where we could identify them and take action against them," Whitman said. Somali Islamic extremists are accused of sheltering suspects in the 1998 embassy bombings. American officials also want to ensure the militants no longer pose a threat to Somalia's U.N.-backed transitional government. The aircraft carrier USS Dwight D. Eisenhower has arrived off Somalia's coast and launched intelligence-gathering missions over Somalia, the U.S. military said. Three other U.S. warships were conducting anti-terror operations. U.S. warships have been seeking to capture al Qaeda members thought to be fleeing Somalia by sea after Ethiopia's military invaded Dec. 24 in support of the interim Somali government. The offensive drove the Islamic militia out of much of southern Somalia, including the capital Mogadishu, and toward the Kenyan border. The AC-130, a four engine turboprop-driven aircraft, is armed with 40 mm cannon that fire 120 rounds per minute and a 105 mm cannon, normally a field artillery weapon. 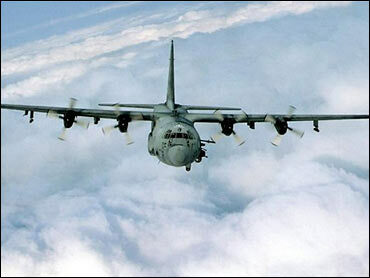 The plane's latest version, the AC-130U, known as "Spooky," also carries Gatling gun-type 20 mm cannon. The gunships were designed primarily for battlefield use to place saturated fire on massed troops. The gunship flew from its base in Djibouti down to the southern tip of Somalia, Martin reported, where the al Qaeda operatives had fled after being chased out of the capital of Mogadishu by Ethiopian troops backed by the United States. President Abdullahi Yusuf, head of the U.N.-backed transitional government, told journalists in Mogadishu that the U.S. "has a right to bombard terrorist suspects who attacked its embassies in Kenya and Tanzania." Other Somalis in the capital said the attacks would increase anti-American sentiment in their largely Muslim country. Many Somalis are already upset by the presence of troops from neighboring Ethiopia, which has a large Christian population. The U.S. Embassy in Nairobi, Kenya, on Tuesday reissued a terror warning to Americans living in or visiting the Horn of Africa. It was the first overt military action by the U.S. in Somalia since it led a U.N. force that intervened in the 1990s in an effort to fight famine. The mission led to clashes between U.N. forces and Somali warlords, including the battle, chronicled in the book and movie "Black Hawk Down," that killed 18 U.S. soldiers. Mohamed Mahmud Burale told the AP by telephone that at least four civilians were killed Monday evening in Hayi, including his young son. His report could not be independently verified. Government spokesman Abdirahman Dinari said it was not known how many people were killed, "but we understand there were a lot of casualties. Most were Islamic fighters." Another attack by an AC-130 gunship reportedly occurred Monday afternoon on Badmadow island, in a group of six rocky islands known as Ras Kamboni — a suspected terrorist training base. Thickets provide dense cover and the only road to the area is virtually impassable, locals said. The U.S. military's main target on the island was thought to be Fazul Abdullah Mohammed, who allegedly planned the 1998 attacks on the U.S. embassies in Kenya and Tanzania that killed 225 people. Leaders of Somalia's Islamic movement have vowed from their hideouts to launch an Iraq-style guerrilla war, and al Qaeda chief Osama bin Laden's deputy has called on militants to carry out suicide attacks on Ethiopian troops. In an interview published Tuesday in the French newspaper Le Monde, Ethiopian Prime Minister Meles Zenawi said that suspected terrorists from Canada, Britain, Pakistan and elsewhere were among those captured or killed during recent military operations. Somalia has not had an effective central government since warlords toppled dictator Mohamed Siad Barre in 1991. The warlords turned on each other, creating chaos in the nation of 7 million people. European Union foreign policy chief Javier Solana said he told U.N. Secretary-General Ban Ki-moon that a U.N. peacekeeping force may be needed to guarantee security and stability in Somalia.